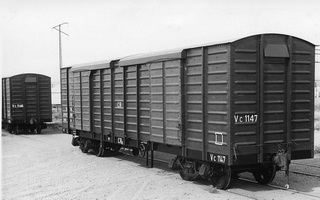 Contract Number 1803 was awarded in 1951 to "La Brogeoise et Nicaise & Delcuve" for the construction of 80 steel covered goods vans, which were classified "VC" and allocated road numbers 1127 through 1206. 22.1.1953 Entered service as "VC" van. 18.3.1953 Entered service as "VC" van. 13.3.1953 Entered service as "VC" van. 5.12.1952 Entered service as "VC" van. 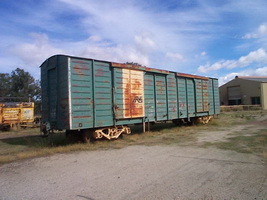 - Converted to standard gauge "XA 1131" for use on Breakdown van, Alice Springs. 9.12.1952 Entered service as "VC" van. 26.3.1953 Entered service as "VC" van. 24.12.1952 Entered service as "VC" van. 28.1.1953 Entered service as "VC" van. 30.1.1953 Entered service as "VC" van. 9.12.1953 Entered service as "VC" van. 5.12.1953 Entered service as "VC" van. 18.2.1954 Entered service as "VC" van. 19.3.1953 Entered service as "VC" van. 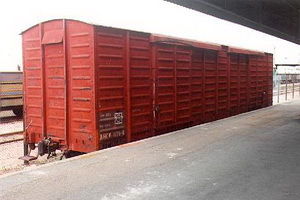 5.1987 Converted to grain hopper, recoded "AHDL 90". 11.2.1954 Entered service as "VC" van. 15.2.1954 Entered service as "VC" van. 28.11.1954 Entered service as "VC" van. 5.1987 Converted to grain hopper, recoded "AHDL 85". 8.2.1954 Entered service as "VC" van. 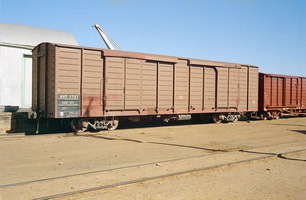 5.1987 Converted to grain hopper, recoded "AHDL 82". 3.2.1953 Entered service as "VC" van. 10.1975 Fitted with steel floor. 10.2.1953 Entered service as "VC" van. 17.3.1953 Entered service as "VC" van. 23.3.1953 Entered service as "VC" van. 10.12.1952 Entered service as "VC" van. 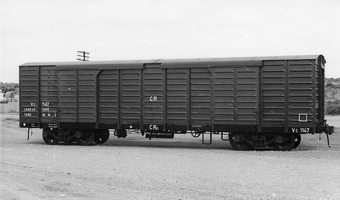 5.1987 Converted to grain hopper, recoded "AHDL 86". 29.1.1953 Entered service as "VC" van. 28.11.1952 Entered service as "VC" van. 5.3.1954 Entered service as "VC" van. 10.3.1954 Entered service as "VC" van. 24.2.1954 Entered service as "VC" van. 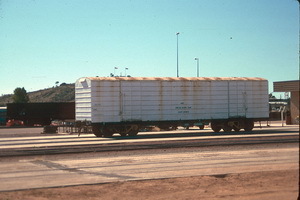 6.1987 Converted to grain hopper coded "AHDL 89". 3.3.1954 Entered service as "VC" van. Note: photos of XA 1164 show it as having a body similar to VD class rather than a VC van, so I'm not sure if it got rebuilt at some stage or is another van renumbered. 23.2.1954 Entered service as "VC" van. 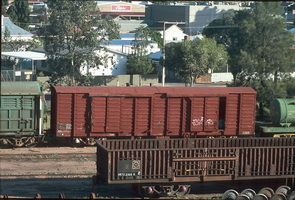 12.7.1963 Converted to "XA 1164" breakdown van for Pt Augusta accident train. 16.3.1954 Entered service as "VC" van. 17.2.1954 Entered service as "VC" van. 26.2.1954 Entered service as "VC" van. 24.3.1953 Entered service as "VC" van. 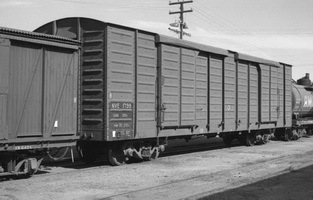 5.1987 Converted to grain hopper, recoded "AHDL 84". 22.3.1954 Entered service as "VC" van. 28.1.1954 Entered service as "VC" van. 15.3.1954 Entered service as "VC" van. 6.2.1953 Entered service as "VC" van. 23.3.1954 Entered service as "VC" van. - To "ABCF" for CCE use. 4.2.1953 Entered service as "VC" van. 31.4.1954 Entered service as "VC" van. - Recodeed "ABCF" for CCE concrete resleepering. 9.3.1953 Entered service as "VC" van. 5.4.1954 Entered service as "VC" van. 5.2.1953 Entered service as "VC" van. 9.2.1953 Entered service as "VC" van. 16.2.1953 Entered service as "VC" van. 12.2.1953 Entered service as "VC" van. 18.2.1953 Entered service as "VC" van. 17.2.1953 Entered service as "VC" van. 12.3.1953 Entered service as "VC" van. 8.3.1954 Entered service as "VC" van. 1996 In use on Parkeston Breakdown Train. By 8.1996 Sold to A.R.H.S.(WA). 2.2.1954 Entered service as "VC" van. 13.2.1953 Entered service as "VC" van. 1.4.1954 Entered service as "VC" van. 5.2.1954 Entered service as "VC" van. 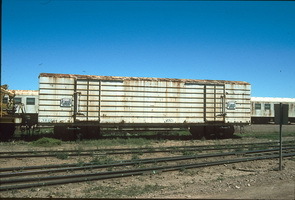 5.1987 Converted to grain hopper, recoded "AHDL 87". 31.3.1953 Entered service as "VC" van. 25.3.1954 Entered service as "VC" van. 11.3.1953 Entered service as "VC" van. - Used by perway maintenance gang Alice Springs. - To "AZBF" perway maintenance Alice Springs. 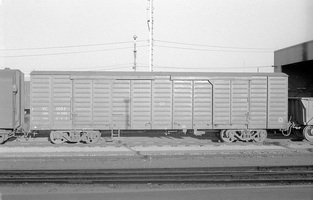 5.1987 Converted to grain hopper, recoded "AHDL 83". 19.2.1954 Entered service as "VC" van. 29.3.1954 Entered service as "VC" van. 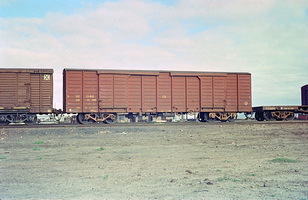 5.1987 Converted to grain hopper, recoded "AHDL 88". 11.2.1953 Entered service as "VC" van. This page was last updated on Wednesday 3 Jan 2018 at 9:24pm.